Anna Bolton | Greene County News Board of Elections Director Llyn McCoy, far left, and Greene County Commissioner Tom Koogler, far right, discuss new voting equipment during a Jan. 24 work session. XENIA — The Greene County Board of Elections (BOE) hopes to have new voting equipment in time for the Tuesday, Nov. 5 general election. 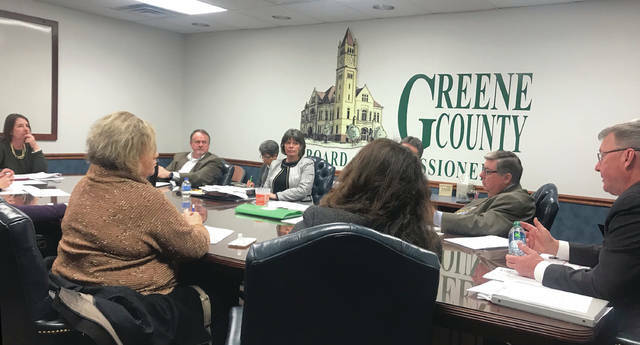 The board met with the Greene County Board of Commissioners Jan. 24, where the two groups discussed different vendors and types of machines. Next steps, in February, will include obtaining price quotes from a handful of potential vendors and looking at the machines in person. Board of Elections Director Llyn McCoy said she aims to order new machines by the end of March, have the equipment in place this summer, go through the acceptance testing process, train poll workers in September and October, all to be ready for use in the November election. If the board does not acquire voting equipment this year, she said, they’ll have to wait until 2021, as the secretary of state’s office won’t allow new voting equipment to be implemented in a presidential election year. Currently, Greene County uses direct-recording electronic (DRE) voting machines. This electronic equipment involves buttons or touchscreens and processes data with a computer program. Other alternatives to DREs are optical scanners, which electronically read paper ballots, and hybrids. Hybrids are a cross between the two, using both touchscreen and optical scan. McCoy said hybrid was the least favorable option to the board overall, although one machine at every polling location will have to be hybrid for disabled voters. According to County Administrator Brandon Huddleson, the state is providing around $1.7 million for the machines — which is what it would cost to implement the optical scanner option for the county. If the cost is higher than that, the county will pick up the additional cost. McCoy said the board’s current preference is a touchscreen machine from vendor Dominion Voting. “Moving backward to a paper ballot is not the way we want to move Greene County,” John Caupp, chair of the BOE, said. Dominion is the board’s current vendor. McCoy noted they had the best customer service and support. The BOE received a preliminary proposal from Dominion Voting, quoting around $3.1 million for 720 machines, which members said was just a starting point, with 720 machines being a high number. https://www.xeniagazette.com/wp-content/uploads/sites/32/2019/01/web1_BOE.jpgAnna Bolton | Greene County News Board of Elections Director Llyn McCoy, far left, and Greene County Commissioner Tom Koogler, far right, discuss new voting equipment during a Jan. 24 work session.